Jack is our chief “Meeter and Greeter”, and therapist-in-training. 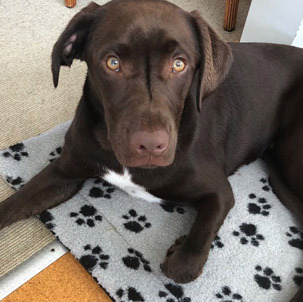 He is a chocolate Labrador, with a “blaze” of white on his chest. Jack is a very happy and “chilled” addition to our team, and can often be found asleep on the rug in a counselling room, or when no-one is looking, on the couch in the waiting room. He loves our clients, but is slowly learning to understand that not everyone is as happy to see him as he is them! He understands that there are some humans who have allergies to dogs, and asks that clients let the office humans know ahead of their appointment so he can stay out of the way when they arrive. You can also now follow Jack on Instagram!